It’s been interesting to collect some telling stories about close encounters with Ali that reveal all of this. Mike Gallagher, an old friend and organizing comrade over many decades, was originally from the Wilkes-Barre area of Pennsylvania. He shared this story involving one of his brothers and his dear mother, now 96. After his championship heyday and before he finally quit the ring, Ali had a training camp up in the mountains in Pennsylvania not too far from where I grew up. Those of you who were in Fair Share will remember our hilarious friend and colleague Richard Montgomery, a sometime sparring partner who knew the facility well. One day my mother and one of my younger brothers were out for a drive. They stopped for gas and soon after Muhammad Ali and his large entourage pulled in to the same station. As they were both filling up, they got to talking, one thing led to another and my mother and brother were invited up the mountain for lunch. There Ali fed them and kept them entertained for the rest of the afternoon with stories and jokes and they left star struck. My mother, who is now 96 and frail but lucid, said he was so charming, kind, funny and warm that the time just flew right by. Tell me that isn’t a dear, dear story! Here’s another one a bit more political. It’s a reminiscence from Beth Butler, a longtime ACORN community organizer in New Orleans involving Ali and Sherman Copelin, who had, with Donald Hubbard, been promoters of Ali’s bout against Leon Spinks in 1978 in the Superdome, and before that were cofounders of SOUL, the 9th ward political organization that played a huge role in African-American and all politics for decades. Muhammad Ali and Sherman Copelin crashed an ACORN PAC (Political Action Committee) meeting in the early 80s, in the lower 9 [9th Ward]. Elizabeth Rogers got a jab in about how “he had done nothing for his people since he left Russia” He was pleased that she remembered, but Sherman thought that it was time to leave, and the group then proceeded to endorse the other candidate. Elizabeth Rogers was an outlier even for an ACORN member back then. With her husband, they were back-to-the-thirties committed leftists, who were white, but lived in the largely African-American lower nine. Rogers held her tongue for no one, and also according to Butler told him to put away his “red handkerchief” because he had more important things to do than magic tricks for all “his people.” That Ali took that “punch with a smile,” also says something profound about the heart and soul of the man. “What I gleaned from Ali’s life, as I’ve lived mine, is that the goal is not to go through life undefeated. The quest is to exercise resilience and come back stronger. 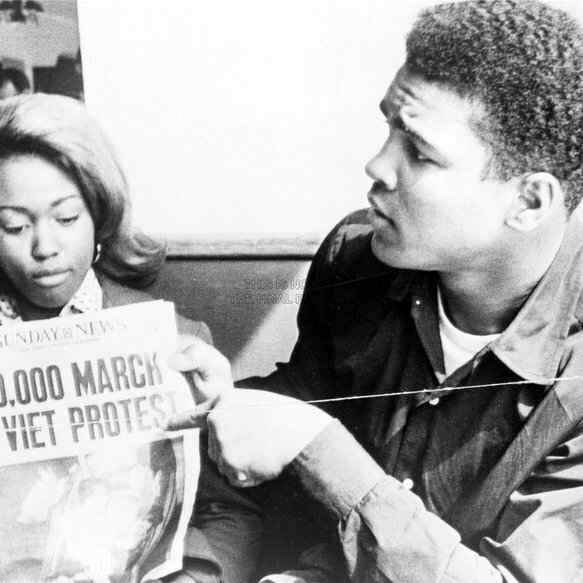 Beloved by much of the world, Ali was nonetheless consistently, unapologetically black. And, a man of the people. All the people. This entry was posted in ACORN, Ideas and Issues and tagged Muhammed Ali, Organizing by Wade. Bookmark the permalink.